JOHN’S, Antigua and Barbuda 13th April, 2018……Antigua and Barbuda’s High Commissioner to London, Her Excellency Karen Mae-Hill joined her CARICOM colleagues in London on Thursday to discuss the issue of undocumented Caribbean migrants in the United Kingdom – a topic which will be discussed during the upcoming Commonwealth Heads of Government Meeting in London. This year marks 70 years since the Windrush arrived with the first Caribbean migrants, who at the invitation of Britain, came to assist with rebuilding. Their contributions played a critical role in the rebuilding of Britain. 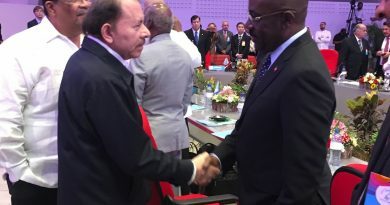 Today, however, some of these migrants, who came at a time when the Caribbean islands were still British colonies, are being treated as illegal migrants, including being detained and deported and denied access to essential services. High Commissioner Hill, following consultation with Foreign Affairs Minister the Hon. E.P Chet Greene, joined her colleagues in releasing a statement that calls upon the UK Government to commit to finding a permanent solution for pre-1971 Commonwealth Caribbean undocumented migrants seeking permanent residence in the United Kingdom. 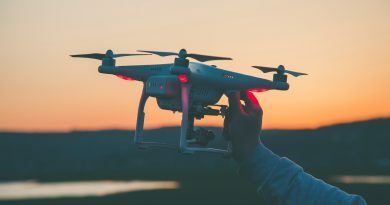 The statement also urges the UK Government to consider reducing the evidentiary burden on these individuals and instead to rely on information the Government already holds, such as NHS, school, tax and National Insurance records. Foreign Affairs Minister, the Hon. E.P. 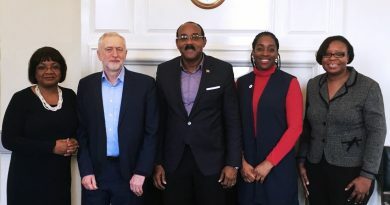 Chet Greene who is a member of Antigua and Barbuda’s delegation to the Commonwealth Heads of Government Meeting in London this coming week, said that this matter will be vigorously advanced by Antigua and Barbuda at the meeting. “The UK has a moral obligation and ethical responsibility to ensure that these undocumented individuals who worked tirelessly in the rebuilding of the “Mother land” are cared for,” Minister Greene noted. Among the many outstanding individuals who call the United Kingdom home; several have either migrated from the Commonwealth Caribbean or can trace their ancestry to migrants, who, at the behest of the Mother Country came by ship to answer the call of the United Kingdom to rebuild after the Second World War. These include nursing pioneer, Mary Seacole; broadcasters: Sir Trevor McDonald and Moira Stuart; cleric: The Right Reverend Dr Wilfred Wood; composer: Errollyn Wallen; army officer and footballer, Walter Tull; footballers: Cyril Regis and John Barnes; academic: Professor Stuart Hall; athlete: Linford Christie; actors: Norman Beaton, Carmen Munroe and Rudolph Walker; racehorse trainer: Sir Michael Stoute and author, Samuel “Sam” Selvon. During 1948 and 1973, approximately 550,000 West Indians (approximately 15 per cent of the population) migrated to the UK to fill labour shortages after the Second World War. Their efforts, commitment and sacrifice were critical in helping to forge the modern Britain celebrated today. On 22nd June 2018, the UK will celebrate the arrival of the Empire Windrush which has come to symbolise the dawning of a new age of post-war migration to Britain. However, their journey was not without its peril. Many of them faced hardship and hostility in the United Kingdom. Some still recall with unease, the infamous signs which read, “No Irish, No blacks, No dogs” and the “Rivers of Blood” speech (50 years ago, this year). Despite these hardship, they persevered and with toil, sweat and tears, they played a pivotal role in helping to build Modern Global Britain. It is against this backdrop that so many of these immigrants – some who have been in the UK since childhood – feel enormous regret and sadness that once again they are facing a new wave of hostility. This time, it is based on their undocumented status. In some cases, it introduces new realities of mental anguish, destitution, detention, and actual possibility of deportation to countries they left as children and would not recognise. They are the parents and children who left the Caribbean for the “Mother Country” as British Subjects, carrying British identity documents, at a time when their Caribbean island homes were still British Colonies. Understandably, they considered themselves British. As such, having secured Leave to Remain, most went to work immediately using their skills in the rebuilding of the UK; some worked and pursued higher education and remained to build Britain better; established multi-generational families and paid their required taxes in the UK. Hence, it never occurred to them that they were not legally British. Unknown to many of them, the situation changed decidedly in 2012, when the Home Office began insisting on systematic immigration checks for anyone seeking to open a new bank account; to secure a driving licence or to access routine health care. At the same time, the Home Office announced the creation of a “really hostile environment” for illegal immigrants. The real challenge today is that the cases of these long-term, elderly, undocumented UK-residents are not being treated as anomalies to be regularised. Instead they are treated as “illegal immigrants”; and as such they are barred from working; refused access to government services including NHS treatment; face loss of welfare and housing benefits and could also lose access to their bank accounts and well-earned pension benefits. According to information from Migration Observatory at Oxford University; some 50,000 Commonwealth-born persons currently resident in the UK are believed to have arrived before 1971 but have not yet had their residency status regularised. Their situation is exacerbated by the Home Office having placed the burden of proof on these individuals to demonstrate that their residency in the UK predates 1971, which requires them, in effect, to provide a portfolio of education and employment records. Despite growing awareness among these undocumented Commonwealth migrants that they need to address their individual situation; cuts to legal-aid services – reportedly from £2.6bn in 2006 to £1.5bn in 2016, and the increase in Home Office fees to £2,389 for Indefinite Leave to Remain – mean that those most likely to face injustice have the least access to the means of securing justice. Furthermore, denying these aging individuals access to their pension benefits and banking services and threatening them with deportation renders it virtually impossible for them to resolve their predicaments on their own. Therefore, the Home Office must be encouraged to reassess, with urgency, the prevailing notion that there are only two groups of residents in the UK – legal residents and illegal immigrants. Evidently, there is a third group, made up significantly of persons originally from the Caribbean, who feel morally and believe personally, and in most cases with support have subsequently proven legally, that they do belong in the United Kingdom. The Home Office should ensure that contact is made, on a consistent basis, with London-based Commonwealth Caribbean High Commissions to advise them of and refer persons in these situations to them. In many cases, these individuals came to the United Kingdom prior to their country’s attaining political Independence, and believing they are indeed British, still may not appreciate the role of Caribbean diplomatic and consular missions. We appeal to the UK Government to commit to finding a permanent solution for pre-1971 Commonwealth Caribbean undocumented migrants seeking permanent residence in the United Kingdom. Likewise, we urge the Government to consider reducing the evidentiary burden on these individuals and instead to rely on information the Government already holds, such as NHS, school, tax and National Insurance records. This is another opportunity for Global Britain to show the world its moral leadership, political courage and readiness to work in partnership with the Commonwealth family of Nations and with due consideration for fairness.